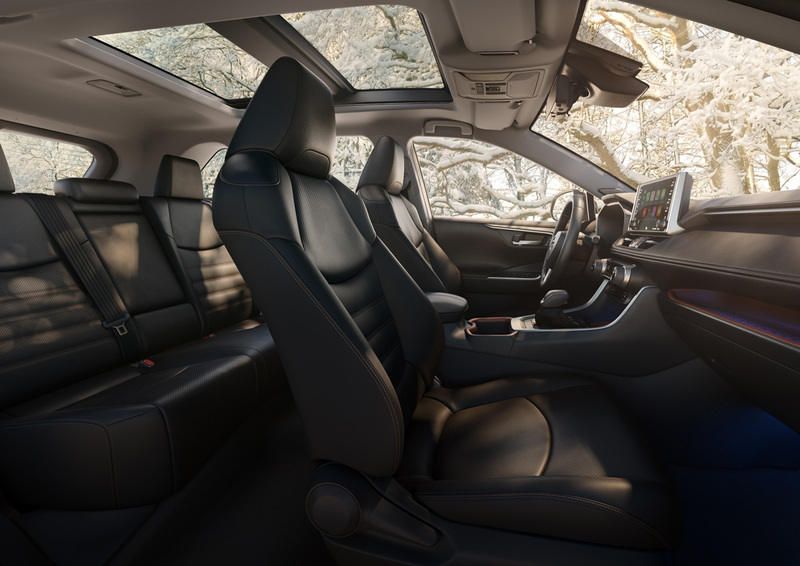 At the new York Auto Show the all-new fifth-generation Toyota RAV4 compact SUV had its coming out party, with bolder and more truck-like styling, new chassis and powertrains, and more technologies than ever. Someone at Toyota got the memo that the Toyota RAV4 wasn’t butch enough. 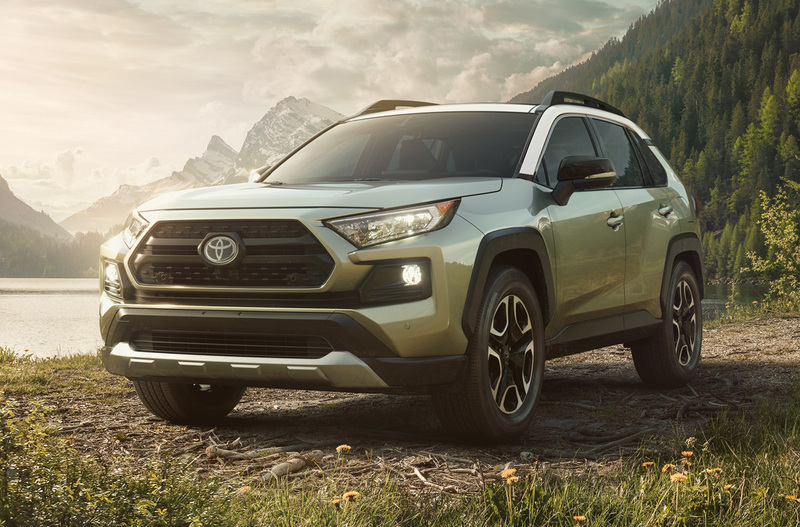 Though the RAV4 has been a top seller in their showrooms as it was, Toyota has definitely taken a new direction in designing the all-new 2019 model in that it’s distinctly more masculine in its forms and design details, its stance and in its abilities. This is to say, a man might actually want to buy one now. Riding on the new TNGA-K platform, it has a longer wheelbase now at 105.9-inches that pushes its wheels to the corners visually, as the overall length actually just a little bit shorter than before. In fact, this new RAV4 remains virtually the same size as the last generation, not ever growing larger like so often happens. Styling and silhouette have taken a turn toward the truck realm, the front looking almost borrowed from the 4Runner. 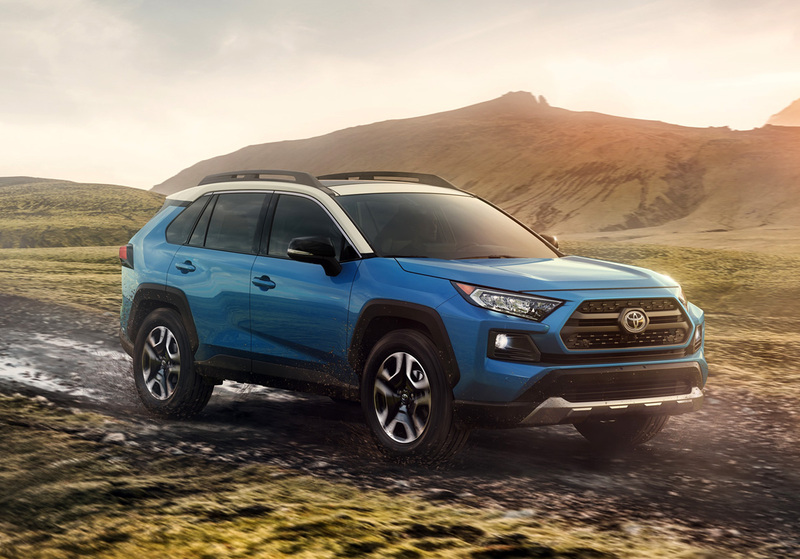 It looks a lot more like an off-road adventure machine than the last RAV4 which might have been compared to an angry video game animal. Trim grades get more distinct and extroverted. The Limited has top-line dress and its new 19-inch wheels yet still has black plastic lower cladding and wheel arch accoutrements. 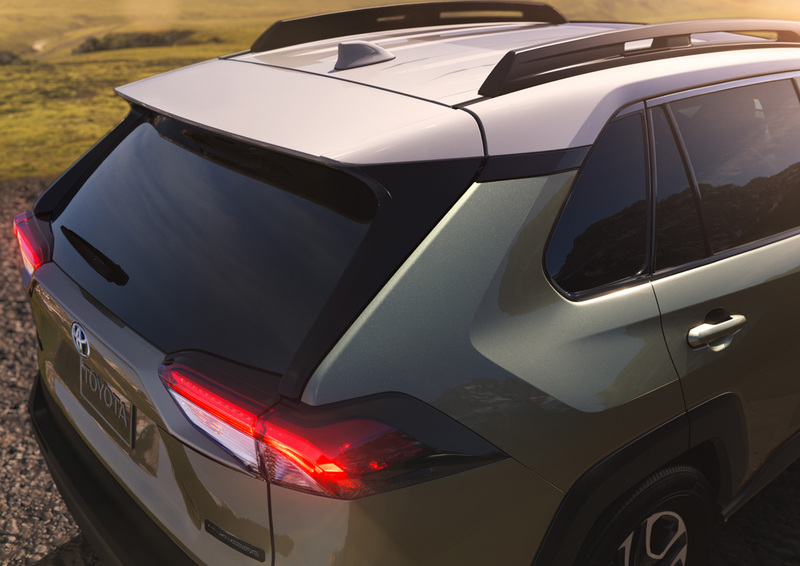 The Adventure trim introduced last year now gets even more character with off-road themed lower cladding, wheels and grille, that really exhibit the most rugged presentation ever seen on a RAV4. It actually has some hair on its chest. 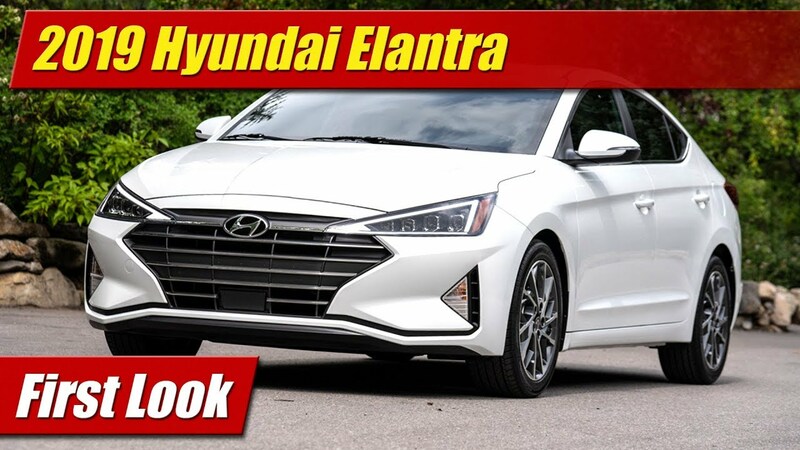 The sporting XSE Hybrid features gloss black body cladding and wheels to go along with an available two-tone paint scheme with an accent colored roof. 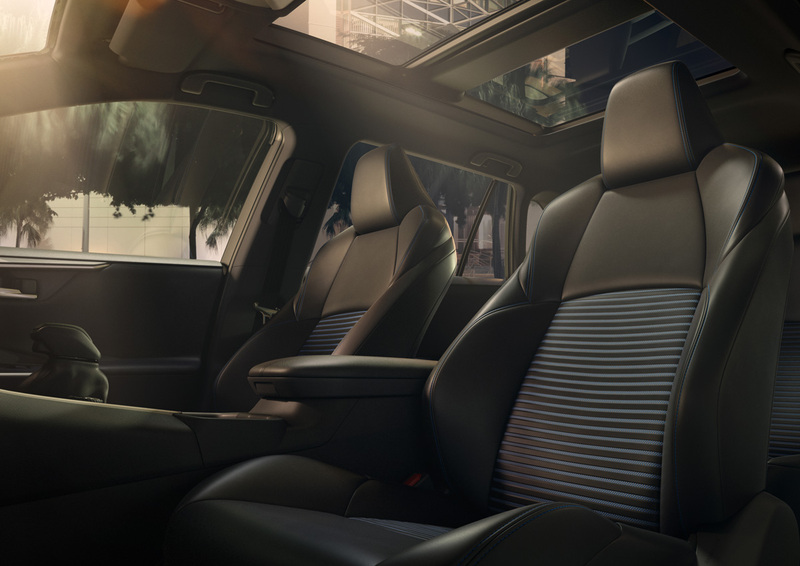 Its cabin also gains a more fun and rugged form in the dash and console that definitely feel more Jeep in theme than in Toyotas of the past. This is seen in the large rubbery knobs of the climate control and the upright floating infotainment screen layout. Seating is elevated with heavily bolstered chairs with more room here and there. 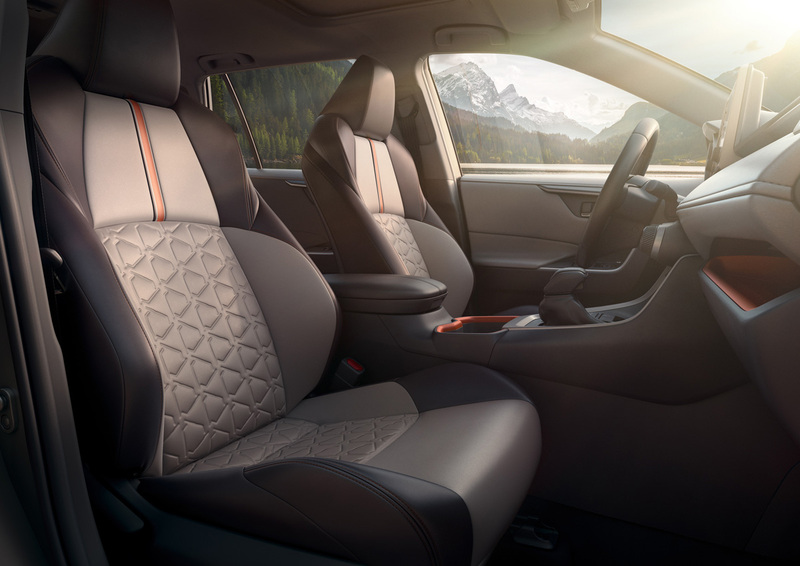 Rich color combinations and expanded choices of materials are now provided across the various trim grades in either cloth or SofTex simulated leather surfaces. 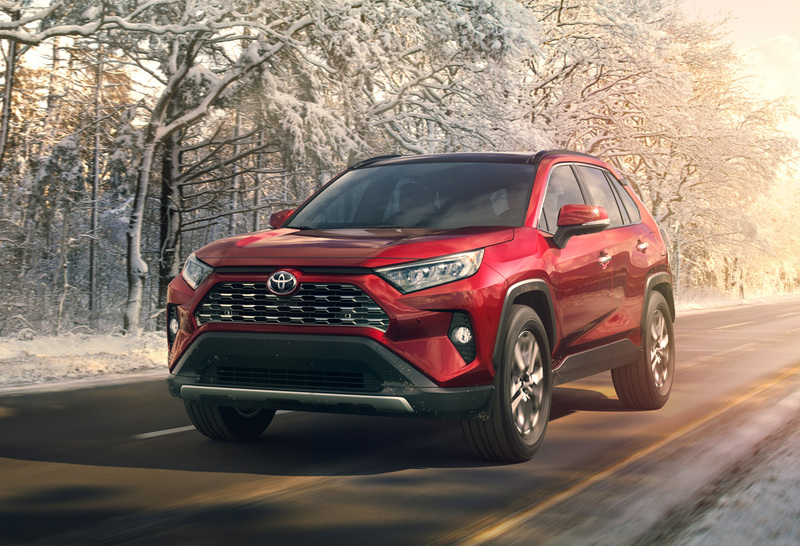 Powering the RAV4 for 2019 is a newly-designed “Dynamic Force” 2.5-liter four-cylinder engine mated exclusively to an all-new 8-speed automatic transmission. 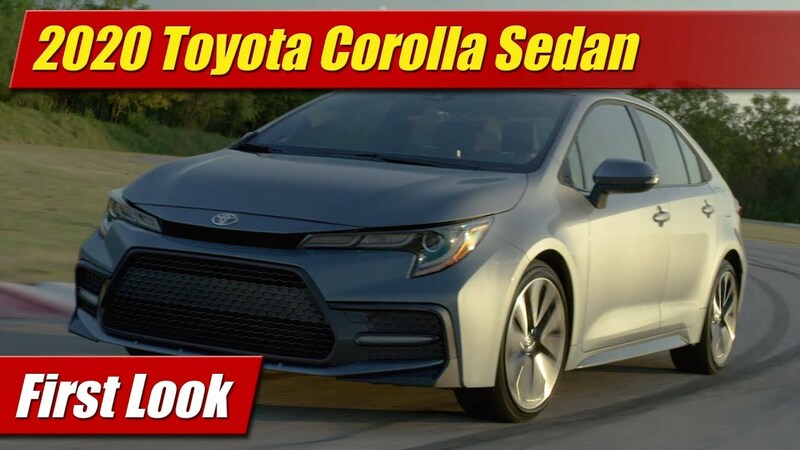 Horsepower figures were not announced but should be similar to the 206 horsepower and 186 pound-feet of torque the same engine produces in the Camry. 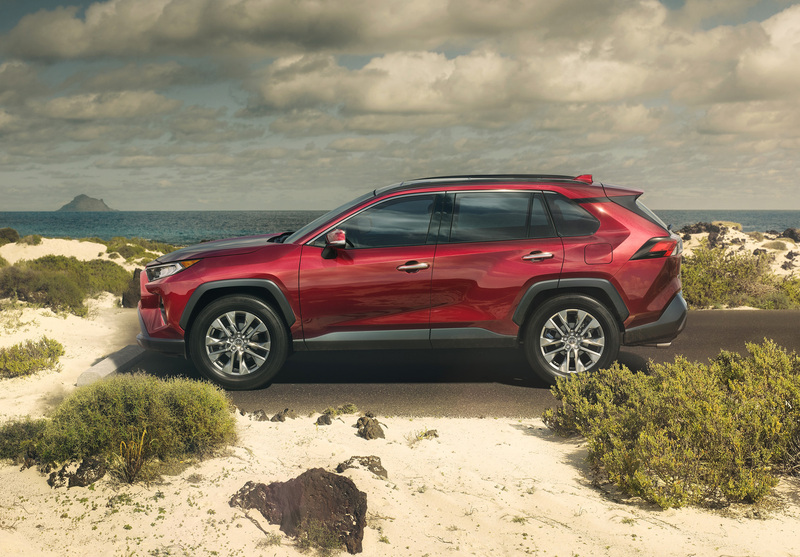 The RAV4 Hybrid gets a 2.5-liter four-cylinder with a second generation hybrid electronically continuously-variable transmission (ECVT). 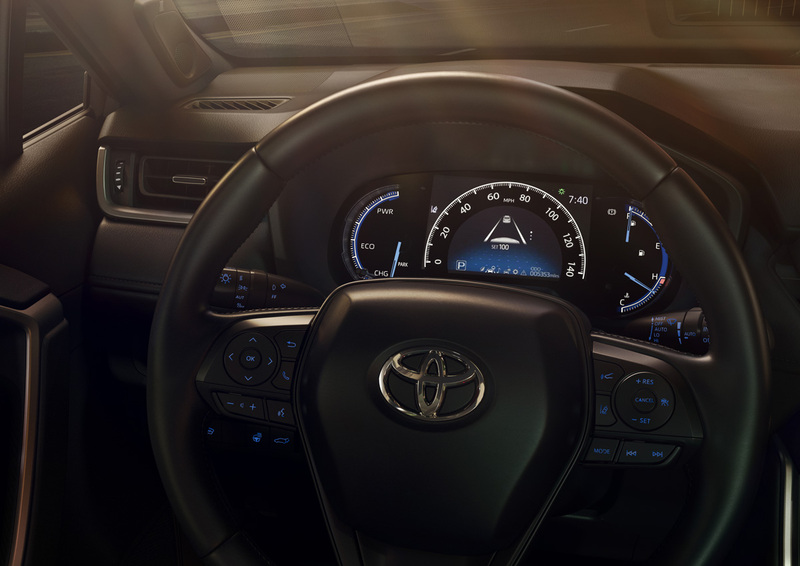 Again horsepower figures weren’t announced but should be similar to the 208 horsepower the powertrain offers in the Camry Hybrid. 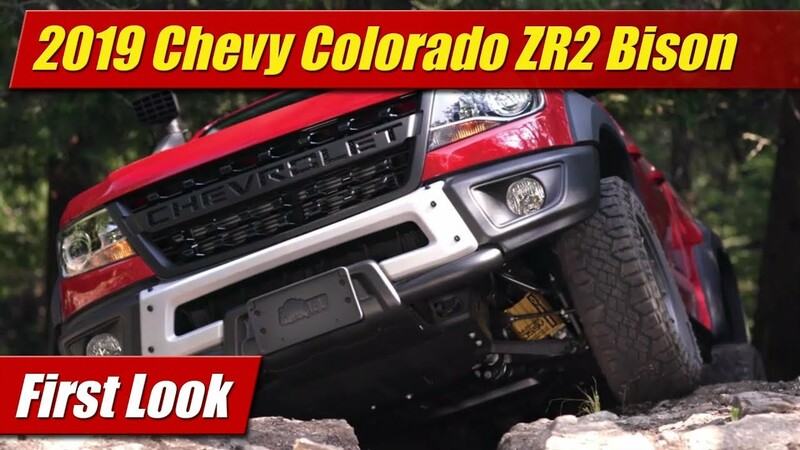 There’s a new high-end dynamic torque vectoring all-wheel-drive system with rear driveline disconnect available on Limited and Adventure grades. A more basic all-wheel-drive system will be available on lower trims. 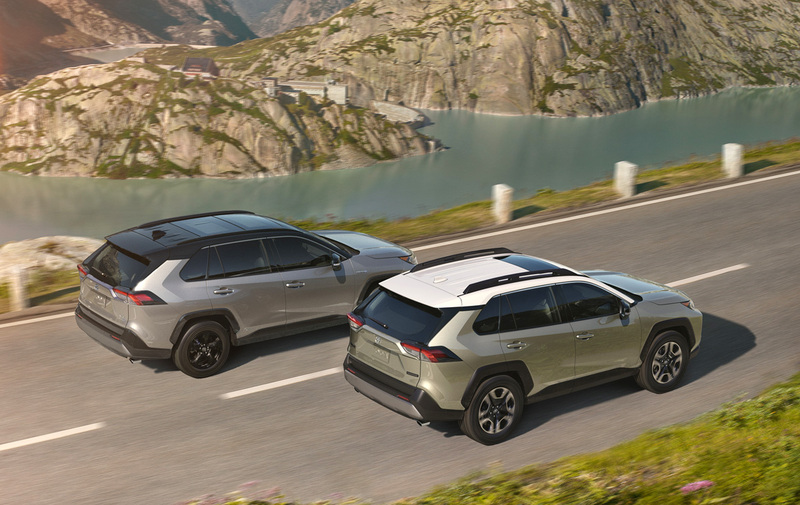 RAV4 Hybrid with all-wheel drive will offer a better control system for 2019 that allows up to 30% more torque to the rear wheels than before for better off-road ability and handling characteristics. 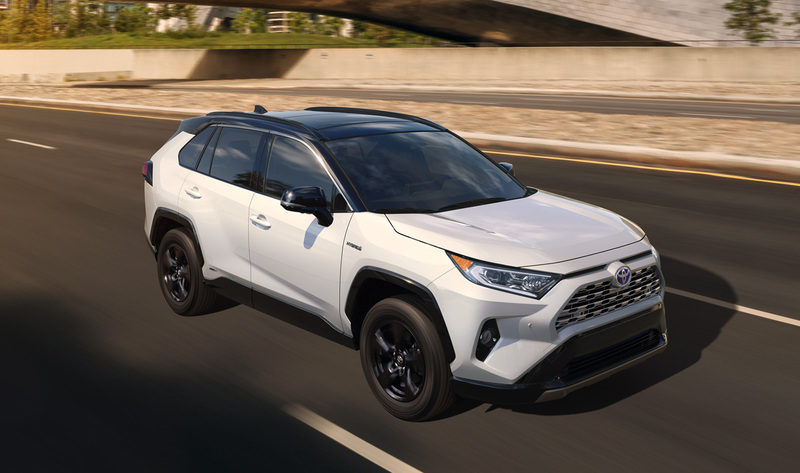 Toyota tells us the new RAV4 Hybrid XSE will be the most powerful and best handling variation of the RAV4 available, with more power and a sport-tuned suspension to go along with its streeted out looks. 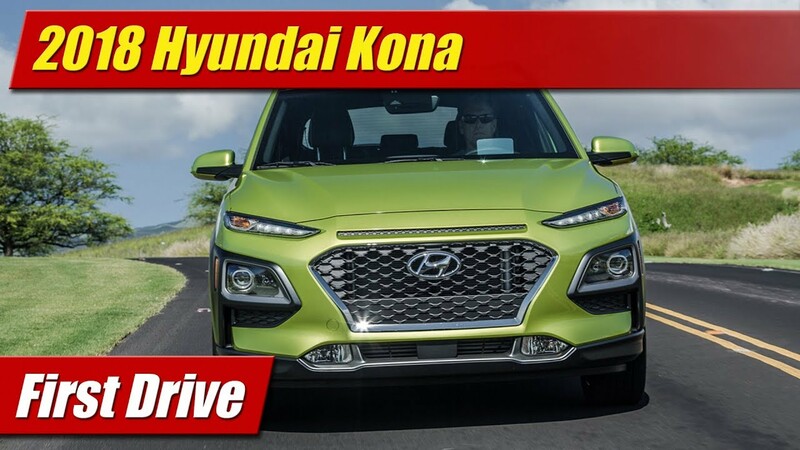 While it’s sexier and more masculine than ever, if not faster and better handling we’d be remiss if we didn’t also share it’s likely the safest RAV4 yet. 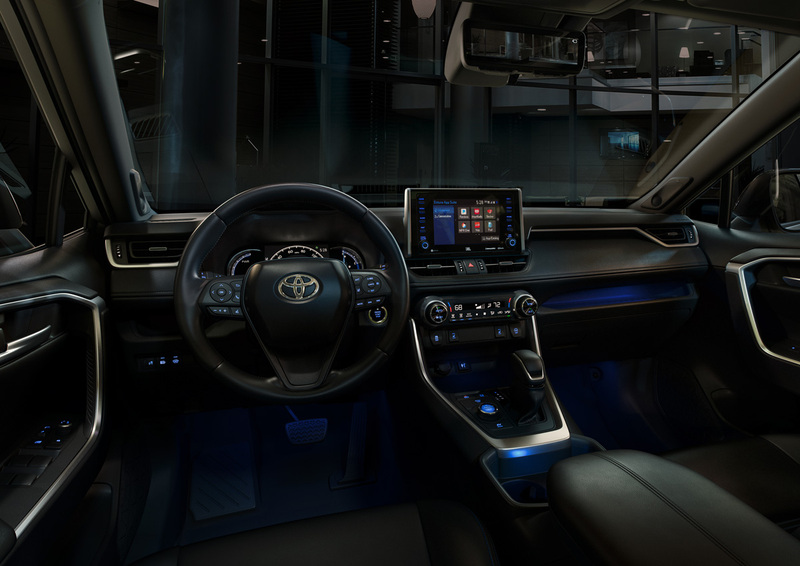 Now standard with Toyota Safety Sense 2.0, it will a wide array of driver assistive systems to go along with its comprehensive list of crash protection systems. 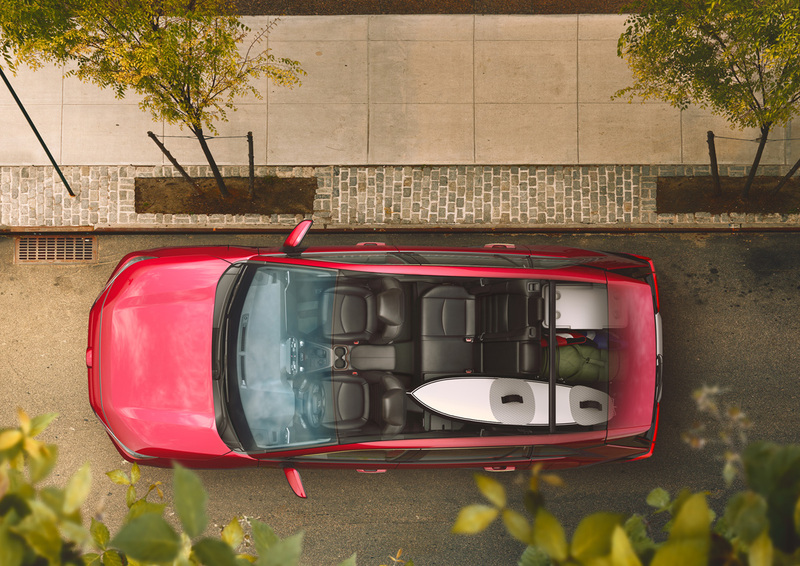 The 2019 Toyota RAV4 goes on sale late this year with pricing and final specifications to come along a little bit closer to that time.